Are you a notes or no notes preacher? That’s the question for today’s post. In the last post we saw that it is helpful to have a map, or outline for your message. Now the question is how you lead people through your map. Who are the most effective communicators, in our opinion? It’s easy for me to make a list: Francis Chan, Rick Warren, Andy Stanley, Al Breems. You may have known the first three names in that list, but you don’t know the last. Al was a friend of mine, and we worked closely together for several years. I invited him to preach in a missions conference at my church, and he did a marvelous job of presenting the challenge. In fact, people were so moved that we doubled our financial commitment to missions that year. What makes these people effective as communicators? Many things, because they all use the principles that I’ve been laying down in this blog. But today I want to call attention to the fact that they all internalize their messages. You don’t see them looking down at notes when they preach. Rather, they keep their connection with the audience the whole time. Before I go on, let me say that I have seen men and women communicate effectively with notes. One man that I considered effective in his preaching style even read his manuscript. But the most effective communicators have mastered the ability of entering into a conversation with their audience. Imagine, for a moment, that you are having an important personal conversation with someone. Imagine that it is even a personal conversation. Now imagine what changes in that conversation when eye contact is repeatedly broken as the person with whom you are speaking consults a sheet of notes on the table between you. That would certainly be distracting, wouldn’t it? It would be communicating something to the audience—that the information is more important than the relationship that you have developed with them to this point. I really don’t remember when I decided to internalize the message and go without notes. I think it was after hearing a lecture by Lloyd Ogilvie about how he went about preparing his messages. He talked to a group of about forty of us preachers, and did so in such an engaging way, that I decided to more directly connect with the congregation. At that time, the church where I was the regular preacher had a massive pulpit, which “hid” everything from the shoulders down. So I also decided to do away with the pulpit. I did keep a small stand on which to keep my Bible. But the response from the congregation was immediate and enthusiastic. With a sudden change, they felt like their pastor was connecting with them with greater directness. Once you have your major point in mind, and you have your outline, think through the flow of the message. What are the major points? You don’t need to memorize word for word, but have a good grasp of the main points you want to make. Familiarize yourself with quotes, poems, illustrations you are going to use. Again, these don’t have to be word for word, initially. But you will want to be able to use your illustrations in a way that powerfully connects with your audience. For me, the crutch is the powerpoint that I use for my messages. The pictures and words that I put on the screen to add a visual display to go with my voice help me remember the big stuff. In a later post I’ll talk about how to use powerpoint effectively. I know of one preacher who prints out the significant sections of his message and incorporates them into the text of the Bible that he is going to be using that day. This helps him get a quick reminder as he reads the Bible for the audience. Of course, there is no substitute for practice. After doing this for many years, I still run through my message in its totality at least 3 times. During those practice sessions, I adjust how words flow, and maybe even think of something else that should be added. 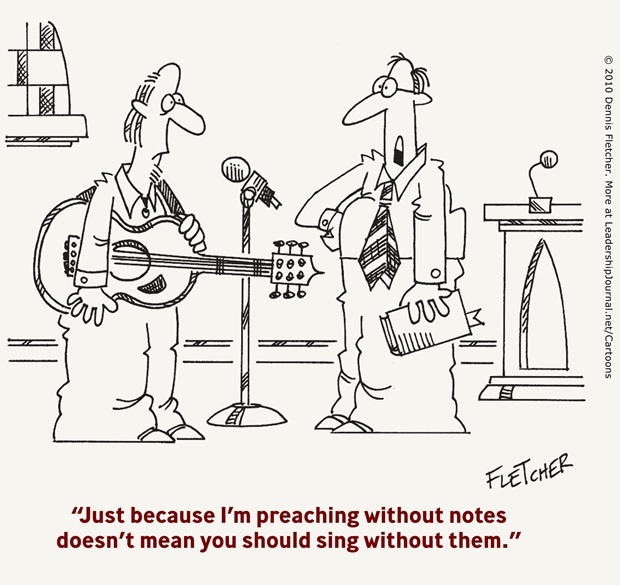 The bottom line is this: If you move to preaching without manuscript or notes, your audience will be blessed. Here’s another view from a video blog.